Upcoming 53-story, 691-foot-tall tower that would replace a decrepit City-owned parking garage located in Winthrop Square in the heart of Downtown Boston. Across the $1.3 billion, 1.592-million-square-foot tower’s top 26 floors would be approximately 500 condominium residences, with approximately 750,000 square feet of commercial office space across 20 floors below. The tower’s first three floors would contain a 12,000-square-foot Great Hall public space. The Great Hall would create a new connection between Winthrop Square and Federal Street and would be lined with 31,000 square feet of restaurant and retail space as well as 21,000 square feet of shared meeting space. Underneath the tower would be five levels of parking containing 550 vehicle spaces. As part of the proposed project, 115,000 square feet of new affordable housing would be created, most likely in Boston’s Chinatown in collaboration with the Asian Community Development Corporation. Millennium would pay the City of Boston $166 million in order to acquire and develop the garage site. Construction of the proposed tower, which would be built to LEED Platinum sustainability specifications, is expected to commence in the second quarter of 2018, with initial occupancy expected by the first quarter of 2022. As site and slurry wall work continues for Winthrop Center the development team has announced a shift in the plans for the common space at the bottom of the project. What was originally dubbed The Great Hall, 12,000 square feet of public space over three floors has been revamped and renamed "The Connector". The update calls for a long lobby across the base of the tower, "connecting" Federal Street and Devonshire, still open to the public and programmed with year-round events. Construction on the 691' tower is expected to be complete in 2022. Foundation work has started for Winthrop Center, the 53-story tower coming to Boston's downtown. The massive project will feature around 500 condo residences along with 750,000 square feet of commercial space. At the base of the tower will be a Great Hall that will create a new connection between Winthrop Square and Federal Street. The Great Hall will offer retail and restaurant options along with 21,000 square feet of shared meeting space. Construction is expected to be complete in 2022. After an official groundbreaking complete with fireworks was celebrated about 1 month ago site work is in full swing for Winthrop Center in downtown Boston. The $1.3 billion project will be Boston's 4th tallest building at 691 feet when complete. The top 26 floors of the tower will contain around 500 condo residences with around 750,000 square feet of office space below. At the base of the project will site three floors of public space dubbed The Great Hall to include a restaurant and retail space along with shared meeting space. There will also be 5 levels of parking underneath the tower with space for 550 cars. First occupancy at The Winthrop center is expected in early 2022. After years of planning the Winthrop Square Tower, now called Winthrop Center, will finally be moving forward with a groundbreaking set for next week. While demolition of the abandoned garage has been ongoing Millenium Partners finally gets the go-ahead to break ground as the City Council voted to appropriate the funds from the sale of the garage earlier this week. The $102 million sale of the property was finalized earlier this month. Funds from the sale will go toward funding open spaces including $23 million to The Boston Common & Franklin Park and $11 million for completion of the Emerald Necklace. The $1.35 billion tower will be Boston's 4th tallest building when complete at 691 feet and will include around 500 condominiums and around 750,000sf of office space. New York-based, Millennium Partners has officially acquired the property at 115 Federal Street in Boston, the site of the Winthrop Square Garage, for $102 million. The property was acquired from the Boston Redevelopment Authority and is planned for an upcoming 53-story, 691-foot-tall tower that would replace a decrepit City-owned parking garage located in Winthrop Square in the heart of Downtown Boston. Across the $1.3 billion, 1.592-million-square-foot tower’s top 26 floors would be approximately 500 condominium residences, with approximately 750,000 square feet of commercial office space across 20 floors below. Site work is in full swing at Winthrop Square in Downtown Boston. Now that the old Winthrop Garage has been removed and approval for the project received in May, work on the 53 story tower is moving forward. This $1.3 billion project will include approximately 500 condos on the upper floors and 750,000 sf of commercial space below. The tower’s first three floors would contain a 12,000-square-foot Great Hall public space set to include restaurant, retail, and public meeting space. The Boston Planning & Development Agency (BPDA) Board of Directors approved a total of nine development projects representing $1.6 billion in investments at the May Board meeting. Altogether, the projects will generate 1,171 residential units and 2,306 jobs once construction is complete. Following a comprehensive public process, the Board approved the 115 Winthrop Square project, paving the way for a $163 million payment to the City of Boston that will be invested in affordable housing and open space. Mayor Martin J. Walsh has committed funds to the Boston Common ($28 million), Franklin Park ($28 million), the Emerald Necklace ($11 million), Boston Housing Authority's Old Colony development in South Boston ($25 million) Orient Heights development in East Boston ($10 million), and $5 million for a City-held fund to benefit the Rose Kennedy Greenway. The project is expected to generate over $15 million a year in property tax revenue and make significant investments in affordable housing and workforce training programs. Millennium Partners has thoroughly redesigned its’ proposed $1.3 billion Winthrop Square tower, shrinking its’ height to 53 stories and 691 feet from 775 feet as originally proposed. Under the new proposal, upper condominium residences have increased from 460 to approximately 500, and office space has increased from 635,000 square feet to approximately 750,000. The tower would also include approximately 31,000 square feet of retail and restaurant space and 21,000 square feet of public meeting space centered about the previously proposed three-story ground-floor Great Hall public space. A previously proposed 14,620 square foot startup accelerator on the tower's second floor has eliminated, though Millennium may consider a similar concept for the project’s final design. A rendering of the project’s latest design is posted above. Given the increase in condominium count, the Winthrop Square tower would generate up to $166 million in payments to the City of Boston, more than the nearly $153 million the original tower would have generated. Millennium’s deal to acquire and develop the City-owned Winthrop Square Garage, which the tower will replace, consists of a $102 million upfront payment and $100 per sold condominium square foot. Millennium will also create 115,000 square feet of new affordable housing as part of the project, most likely in Boston’s Chinatown in collaboration with the Asian Community Development Corporation. Additionally, Millennium has agreed to pay the Friends of the Public Garden $125,000 per year for 40 years following the project’s completion in order to maintain and enhance Boston Common and the Boston Public Garden. Millennium began demolishing the dilapidated Winthrop Square Garage in Fall 2017 in order to make way for the proposed tower, and aims to start construction of the tower in the second quarter of 2018 targeting initial occupancy by the first quarter of 2022. Millennium has filed plans for the revised tower with the Boston Planning & Development Agency (BPDA), who is now reviewing the proposal. After standing vacant and decrepit in the heart of Downtown Boston since 2013, the Winthrop Square Garage is coming down to make way for Millennium Partners’ proposed 700+ foot tall tower. 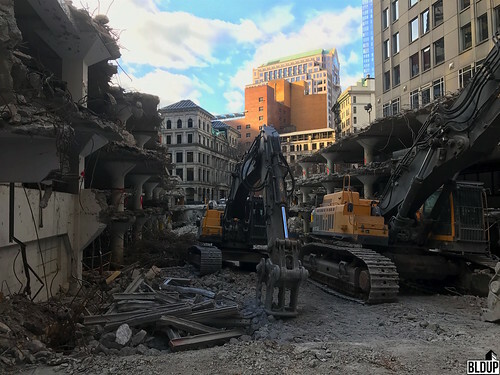 Significant portions of the garage have been demolished, allowing passersby to see directly between Winthrop Square and Federal Street. With the garage demolished, excavation of the proposed tower’s three-level underground parking garage and construction of the tower's foundation will be able to begin. In light of concerns regarding flight paths to and from Logan Airport, Millennium Partners has dropped the height of its' proposed Winthrop Square tower from 775 feet to 702. The 775-foot-tall tower would have stood in the path of a major airport runway, diverting planes to other runways and decreasing Logan Airport's efficiency. “We will not be proposing a building that has any impact on flight paths in or out of Logan International Airport,” said Millennium Partners Principal Joe Larkin in a Boston Globe interview. The height reduction, likely five to seven floors, will likely be taken from the tower's office component as opposed to condominiums; Millennium Partners' $153 million payment to the City of Boston to acquire the Winthrop Square Garage site is partly contingent upon condominium sales. The tower could be made wider in order to compensate for the height loss. With the decreased height, the proposed tower would likely cause shorter shadows upon Boston Common and the Public Garden, a controversial consequence of the previously proposed 775-foot tower. However, added tower width could result in its' own shadow impact. Millennium Partners plans to reveal updated tower plans this Fall. Governor Charlie Baker has approved revisions to state laws that limit casting shadows on Boston Common and the Public Garden, allowing Millennium Partners’ proposed $1.02 billion, 775-foot-tall Winthrop Square tower in the Financial District to move forward with Boston Planning & Development Agency (BPDA) review. Under the revised law, which replaces a law that banned constructing buildings that cast shadows on the parks during the day, Millennium Partners will be able to build the tower pending BPDA approval. The previous law only allowed new buildings to cast shadows on the parks either during the first hour after sunrise or before 7 AM, whichever was later, or during the last hour before sunset. Under the new law, which makes an exemption for Millennium Partners’ proposed tower, a shadow bank for new buildings in the Midtown Cultural District, which would have allowed for new shadows to be cast on the parks after 10 AM, has been eliminated, limiting height of future buildings in the neighborhood. Millennium Partners’ proposed Winthrop Square tower would cast no more than 90 minutes of shadows across part of Boston Common on the morning of September 10th, and no more than 26 minutes of shadows across the Public Garden on the morning of August 24th, with shorter shadows cast across the parks throughout the rest of the year. Boston Mayor Martin J. Walsh and the BPDA both expressed support for the revised law, officially dubbed “An Act protecting sunlight and promoting economic development in the City of Boston.” “This common sense change will better protect the Boston Common and Boston Public Garden for years to come, while allowing a project that will generate hundreds of millions of dollars for Boston’s neighborhoods, parks and public housing to move forward. We look forward to continuing to work with the many community stakeholders and local legislators as this project moves through the Article 80 process,” said BPDA Director Brian Golden in a prepared statement. In addition to BPDA approval, the proposed tower will also require approval from the Federal Aviation Administration (FAA) to reach its’ proposed height of 775 feet tall. Millennium Partners would pay the City of Boston a total of $153 million to acquire the Winthrop Square garage site. Mayor Walsh has pledged the money towards public space improvements, including to Boston Common, and creation of new affordable housing. Millennium Partners has also reached an agreement with the Friends of the Public Garden to pay $125,000 per year for 40 years towards parks improvements. Millennium Partners’ 775-foot-tall tower would feature 36 floors of luxury condominium residences above 14 floors of office space and a 65-foot-tall ground-floor public "Great Hall" lined with three levels of retail. The proponent aims to break ground on the tower in 2018. Boston’s City Council voted Wednesday to approve Millennium Partners’ proposal to build a $1.02 billion, 775-foot-tall tower on the site of the shuttered Winthrop Square Garage in the heart of the Financial District. The tower, which would be Boston’s third-tallest, was approved by a 10-3 margin. Because the proposed tower would cast a new shadow on Boston Common and the Public Garden, the tower will also require approval from Mayor Martin J. Walsh, the State Legislature and Governor Charlie Baker. Mayor Walsh has expressed support for Millennium’s proposal. Shadow coverage would be no more than 90 minutes across part of Boston Common on the morning of September 10th, and no more than 26 minutes across the Public Garden on the morning of August 24th; shorter shadows would be cast across the parks the rest of the year. Millennium’s proposal calls for 36 floors of luxury condominium residences above 14 floors of office space and a 65-foot-tall ground-floor public "Great Hall" lined with three levels of retail. Millennium would pay the City of Boston a total of $153 million to acquire the garage site. At last night's board meeting, the Boston Planning & Development Agency (BPDA) officially tentatively designated Millennium Partners as the developer of the Winthrop Square Garage in the Financial District. Millennium Partners will pay the BPDA about $153 million for the Winthrop Square site, including $10 million upfront for the site, $92 million when a building permit is obtained and approximately $51 million when condominium closings commence. Millennium Partners expects to break ground at Winthrop Square by September or October 2017, The Boston Globe reports. “We’re eager to get going,” says Millennium Partners executive Joe Larkin. The BPDA selected Millennium Partners as the Garage's developer in August 2016 from a pool of six contestants. Millennium Partners' proposal will now undergo official review for construction approval. In an official release today, the Boston Redevelopment Authority (BRA) and the City of Boston announced that Millennium Partners has been selected as the developer of the 115 Winthrop Square site and that negotiations for sale of the site will commence imminently; the following is a link to the release. Millennium Partners proposes to construct a 55-story, 750-foot tall tower containing 36 upper floors of condominiums across 612,000 square feet, 14 floors of office space across 442,400 square feet and a 65-foot high, 13,000 square foot ground-floor public "Great Hall" lined with three levels of retail. A 14,620 square foot startup accelerator would be built on the tower's second floor. Millennium Partners' tower would cost a total of approximately $1.02 billion to build. Per Millennium Partners' proposal submission, the firm has access to the approximately $331 million of equity required to develop the tower without a financial partner; the following is a link to the proposal submission. Construction of the tower could commence in summer of 2017, with initial occupancy in summer of 2020. Sustainable and environmentally-friendly design, as evidenced by the submission's targeted LEED Platinum certification. If achieved, Millennium Partners' tower at 115 Winthrop Square would be Boston's second LEED Platinum residential tower, the first being Atlantic Wharf. Public space improvements anchored by the ground-floor "Great Hall," which would host arts performances and community events and would be lined with multiple retail options. Dynamic uses in Downtown Boston including residential units, retail, office space and a startup accelerator. Partnership with the Asian Community Development Corporation (ACDC) for and contribution of $25 million towards creation of new affordable housing in Chinatown.